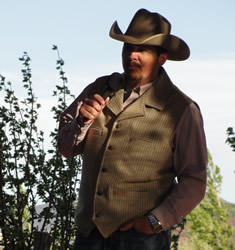 Dudley Elliott is a local rancher and musician. He's known for his cowboy and western vocals and guitar music. As a resident of Wayne County, Elliott is a local legend who enjoys sharing his talents at a variety of local events. Mike Moutoux is a cowboy-singer-songwriter from Silver City, New Mexico. 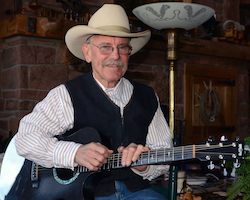 Also known as “New Mexico’s Enchanting Cowboy”, he specializes in turning ranch work into cowboy songs and cowboy poetry that give listeners a rare look into the ife of a working cowboy. “I’ve helped to pull calves and watched them take their first breath, laid on the ground in the mud and blood doctoring cows, been chased by cows, kicked by cows, fallen off a horse or two, and just generally collected too many fond memories to remember.” His work has taken him high into the Pecos Wilderness in northern New Mexico; to the rolling hills and arroyos of southwest New Mexico; and to the flat mesquite plains near Carlsbad. He has shared stages with all the western music greats and has been a friend to all as a radio DJ, festival emcee, and concert producer. “I want to put everyone in the audience as close to being in the saddle as words and music allow—and at the same time leave ‘em laughing,” he says. He plays a mix of songs, mostly his own, but always includes some classics the audience is sure to recognize. There will be wild rides, cattle drives, and endless big blue skies all wrapped up in poetry and song. With his smooth voice, authentic material, and a wonderful sense of humor, it doesn’t take long for an audience to appreciate what enchanting means: captivating and charming. He has been a friend to many performe.rs as a DJ for KSIL radio in Silver City, the producer of the Cowboy Concert Series, and as a talent wrangler and Master of Ceremonies for the Tyrone Cowboy Poetry and Music Festival. He is a regular on the poetry and music circuit especially in New Mexico, Arizona and Colorado. “My wife and I enjoy the gatherings and meeting up with old friends and making new ones as well. The gatherings are really like family reunions and while I enjoy performing, I like visiting with friends just as much. Go to Mike's website for more information. 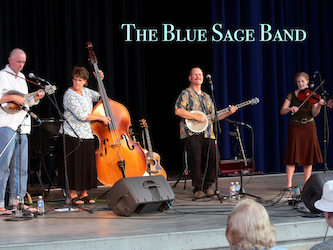 Featuring banjo, bass, guitar, dobro and mandolin, the Blue Sage Band is a high energy acoustic folk ensemble specializing in Bluegrass, Folk, Western and Americana. The music of Blue Sage revolves around the repertoire of band leader Mike Iverson, know worldwide as part of an elite group of progressive clawhammer banjo players. Joining Mike on stage are three of Utah’s finest acoustic musicians. Heather Blaisdell (fiddle) and Ken Sager (mandolin, dobro) provide hot improvisational solos that soar above the powerful sound of Shauna Iverson's driving bass fiddle. Blending elements of bluegrass, folk, blues, rock, and jazz; this configuration defies description. The one constant is the use of the clawhammer style of banjo in genres of music which have seldom heard it's unique sound! Go to the Mike Iverson's website to learn more. Western Songs, Western Stories…Jim Jones is a Western folk artist who tells it like it was, isand will be in the great American West. Native Texan, student of the West, he lives, sings and writes about cowboys, horses, cattle rustlers and such. He also knows there’s more to the story…how the coming of the train changed the West, how critical water is for survival. He’s performed in honky-tonks and churches, schools and Irish pubs, campfires and high teas. 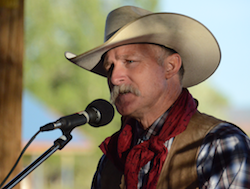 Jim’s singing, songwriting, hot guitar-picking and winning personality keeps him in demand on the Western music circuit, folk music venues and at house concerts, coffeehouses, schools and libraries throughout the country. 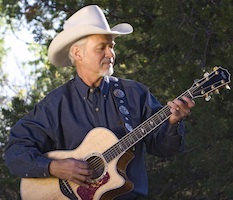 The 2012 release of “Borrowed Time,” led to a 2013 Western Writers of America Spur Award for Western Song of the Year for his “Texas is Burnin’.” He now has eight Western Folk albums and three Western historical fiction novels under his belt. His award-winning books, the Jared Delaney trilogy-Rustler’s Moon, Colorado Moon andWaning Moon are set in northern New Mexico, “loosely based in fact…basically, a pack of lies I made up.” They have educated, informed and entertained readers around the world. Direct from The wild west of California, the incredible Crosstown Cowboys. 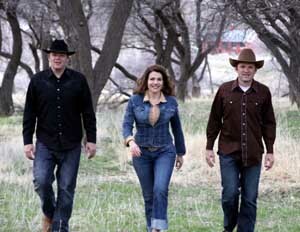 are a top rated for their Western Swing album, "That Old Prairie Moon". 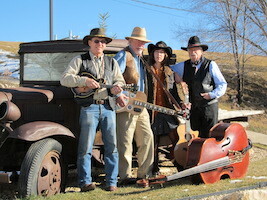 Cross Town Cowboys write and perform original western music with an inspirational message. 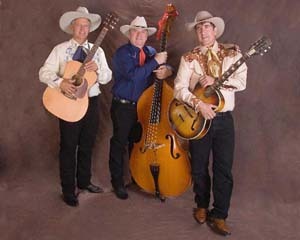 The Action, California-based act’s debut was nominated for Best Cowboy/Western Swing album for 2008 by the Western Music Association. The photo on the right shows the Cross Town Cowboys. From Coalville, Utah, they play classic country, bluegrass, and folk. To learn more, LIKE their Facebook page. 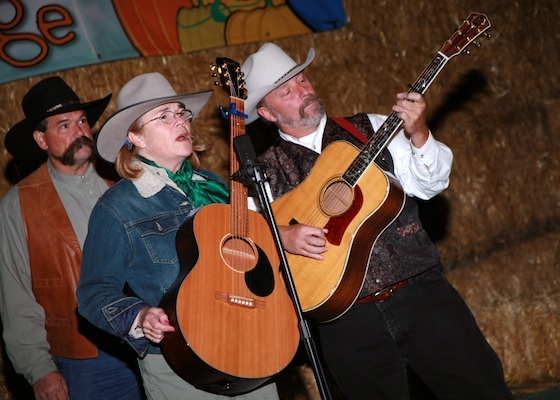 Having performed together for over ten years, this exciting group brings forth their talents and life experiences in the form of traditional and contemporary cowboy poetry mixed together with old-time western songs. Their fast paced and engaging show will put a smile on your face and have you singing along. The Band consists of Gary Fulton, the poet who weaves together his stories and tales in a real down home cowboy way. Jim Witherspoon is on lead guitar, mandolin, and vocals along with his wife Janet Witherspoon who plays rhythm guitar, sings, and yodels. Recently joining the herd, David Nay sings and thumps the bass. A common thread bonds together the members of this group. All four were born and raised in the Real West. Old Leather brings to their fans an authentic blend of family friendly, toe-tapping music, poetry and humor that is sure to please. J.C. Needham is a buckaroo balladeer nominated as Western male vocalist of the year by the Western Music Assoc. J.C. is deeply rooted in the west desert of Utah and the lonely expanses and the cows, cowboys and great expanses inflect his songs with a Great Basin earthiness that defines the genre. Mary Kaye Knaphaus is back by popular demand! She was the 2010 Western Music Association Vocalist of the Year. The photo on the right shows Mary Kaye. Jeff Chappell is as authentic as a pair of well-worn batwing chaps. A general practitioner at Wayne County's medical clinic, he is also an in-demand musician. A native of Wayne County, his performances have a lived-in feel that cannot be faked.